Continuation of this nice pattern we're currently in, with storms likely to be widespread across NSW today. Looks like a thick upper-level cloud deck will be in place over the east coast and ranges during maximum heating, with a progressive clearing on the western slopes. Should be some electrically active cells around and some good falls (now don't say it out too loud, ssshhh, but the weekend is looking rather interesting for severe storms ). I'll whisper this as quiet as I can... I hope your right. sshhhh I didn't say that. All these HP storms are great with nice rain totals and all but I'm praying we see something photographically worthwhile! I'm getting depressed posting grey-ish heavy rain showers, I'd like to show you guys something decent from out this way for a change, we are called Lightning Ridge for a reason, not Rain Shower Ridge lol! Just had some nice severe storms go through Penrith and onto Sydney. I watched a particular cell which anchored itself for around an hour just west of Penrith and it was quite severe looking at times. It also exhibited some base rotation at times along with plenty of strong upmotion until it finally caved in and went with the flow. This morning saw me out at Minchinbury, and by the time I left there were some nice cells starting to build up to the west (about 10:30). I then went to a job at Fivedock, where we were doing some work on a roof. Well we got one end finished and decided to leave the other until tomorrow morning! The front of the cloud had gone over us by the time I went outside (grabbed a couple of snaps anyway - will post later) and we had quite a few spectacular CGs and short heavy rain. I was told later there was small hail at Rydalmere. Some very nice close lightning strikes though, just a shame they are so hard to photo during the day. Maybe I will have to get a videocamera I can just grab stills off. Now that was entertaining. On the radar I saw the latest storms forming to the NW with the Bureau issuing a severe storm warning more for areas N and NE of here. It was building up quite nicely and hit Rydalmere at about 5:30. Lots of close strikes as it came over and some heavy rain and small hail. I saw a couple of hits come down about 3 houses away, and there were plenty more very close ones behind whichever side of the house I chose to be looking out of at the time. I set the digital camera up and shot about 25 minutes of 640x480 video, so it will be interesting to see what strikes I can capture from that lot. I know I got a few on there! If it's the same cell I was on I managed to get a decent vantage point just in time (after rushing home from work) to see it start spinning away. http://www.ecstormchasing.com/video/3rddec_sydroto.wmv - Timelapse of the base that shows this effect. There was a bit of rotation going on in the one that came over here late this afternoon. Would have caught some of that on the video. Grabbed a few good ones of yesterday's videos, shame about the poor resolution and slight lack of quality from having a cheap digital camera. I created an album in the section, hopefully did it right! Now if I get this bit correct we should get some thumbnails of the storms. The first one is interesting because it was quite close, the lightning bolt was an unusual shape, and then the colour change after it hit whatever it hit. I initially thought it was a house, but looking at the angle it was taken from could well have been a tree a bit further away. The others are just some bolts captured on the video as well. MB edit - made links to the full sized pics. haha ...I'm getting seriously dizzy with GFS and its forecasts of -7 Li sometime this weekend, somewhere in eastern Australia between 23 and 40 south. After the previous several runs writing it off, now it seems to be back in the forecasts. I think it's game on myself, but we'll see! As far as Wednesday went, I was at work, took a lunch break to check out the stuff that developed over the western suburbs during the early afternoon. Not much doing so I headed back to North Ryde. I was even more surprised that there was a decent low-level circulation evident with a bowl funnel at the centre of the circulation. Not only that there appeared to be a clear slot working in (will post video when i get around to editing it). As I was watching, it occurred to me that was going though the same visible process as the Attica Ks low-level meso (I was in a similar position, looking almost up) -- except that it was brief.....5 minutes or so, and smaller in scale. The lightning was close and becoming very frequent. In fact, immediately following the demise of the circulation, there was a barrage of CGs! I retreated to the cover of the carpark as rain began and the CG's continued, it was quite a show. Next door was a power substation so I pointed that way. These are very close bolts accompanied by immediate gunshots of thunder! Being already out in the country, I was destined to chase activity near Dubbo. On the 3rd December 2007, I chased out SW of Dubbo only to meet the linear activity - the outflow unfortunately destroying any chance for activity near Dubbo itself. After some shots and observing the green cores as well as two dust devils within the vicinity of the boundary, I decided to head north though the storms further north became rather disorganised. Although the storms likely has hail, I ensured I ventured away from this region due to possibility of getting stuck. Not much photo wise to report due to distance to the storms. I noted that David Croan was in the Auburn area for the 5 pm storm which was intense. 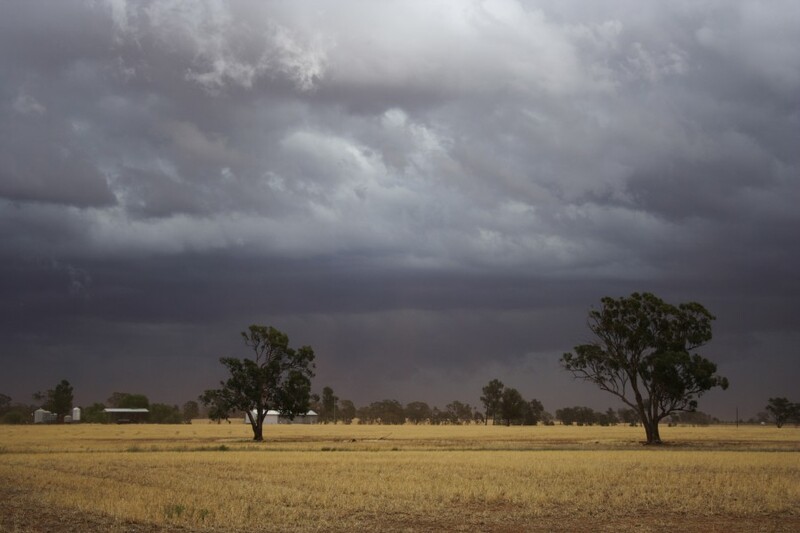 There was a storm at 1.30 pm in the same region that was just as intense as this one. I took numerous still photos of it as it progressed from the north west till it was over head. The Auburn / Homebush Bay and Lidcombe region was hardest hit from this 1.30 pm high intensity storm with small hail 1 cm in diameter being observed as well as brief local flash flooding. I received a report of more intense or slightly larger hail on the M4 around the Silverwater Road area. Rain gauges recorded up to 21 mm which fell in no more than 10 to 12 minutes. Other nearby totals were less. The storm weakened once it moved further east and crossed the coast. At 5 pm, I was following a second wave of storms over western Sydney which weakened but they appear to have produced an outflow boundary because a new stronger cell developed further east over Pennant Hills and the Hills district that dumped heavy rain. This storm had a short life span but again, the Auburn region scored some of the highest rainfall totals again (Another 21 mm). I took several more photos of this one. These high intensity but brief storms did cause some trouble for the Council I work for because they resulted in calls for short term road closures due to sudden inundation. Olympic Drive around the Lidcombe Town Centre was affected as the drainage networks in this area could not handle these intense cells too well. That aside, the 5 pm storm certainly put on a barrage of CG lightning but as with the first storm, it quickly lost momentum and became outflow dominant then weakened.